Google Maps is a web mapping service application from Google mainly for map-based services purpose, which including Google Maps website, Google Ride Finder, Google Transit, and maps embedded on third-party websites via the Google Maps API. With Google Maps, users can view street maps, route planner for traveling by foot, car or public transport and an urban business locator for numerous countries around the world. Google Maps also features multiple map types and map type control, scale control, street view, Google Earth, Geocoding service, location markers, and configurable location icons. In order for Android users to enjoy the new features of Google Maps on their Android devices, Google has released a new version of Google Maps 6.7 for Android operating systems. This release has been added with several new features such as indoor navigation (cool) and integrates Google Offers to show you nearby deals (meh). Indoor navigation included indoor maps and walking directions of select businesses and venues that currently available for U.S. and Japan. With this new features, users able to view 360-degree interior photos of businesses to help users intrepidly make the way indoors and out. To see Google Offers on a map, tap “Maps” and then “Offers.” Some Google Offers can be purchased or “saved for later” for future use while others are immediately available for free. 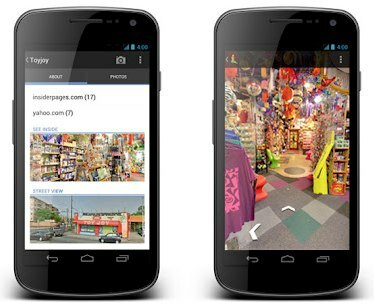 Download Google Maps 6.7 for Android from Google Play and start to find and discover places to eat, shop and play today.